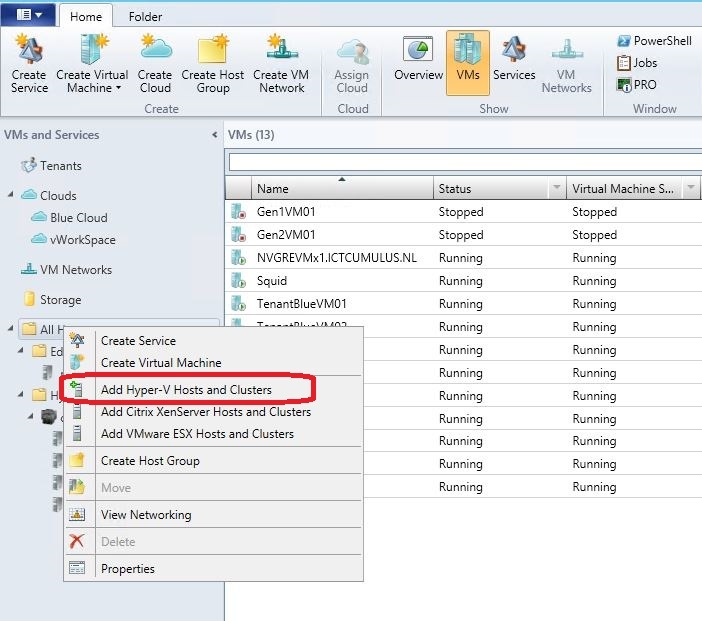 Get started with Cluster OS Rolling Upgrade in Windows Server 2016! Download the evaluation version! Categories: Hyper-V, Windows Server 2012 R2, Windows Server 2016 | Tags: Cluster, HyperV, Microsoft, WindowsServer2016, winserv | Permalink. 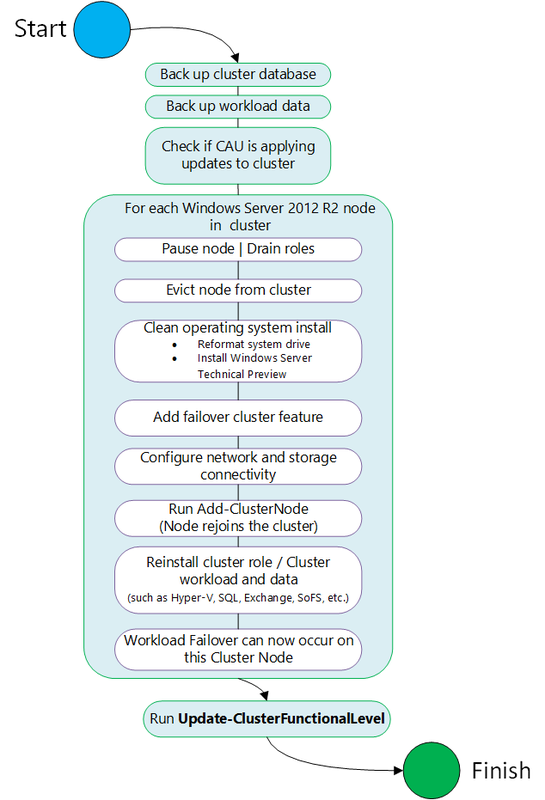 Cluster Operating System (OS) Rolling Upgrade is a new feature in Windows Server Technical Preview that enables an administrator to upgrade the operating system of the cluster nodes from Windows Server 2012 R2 to Windows Server Technical Preview without stopping the Hyper-V or the Scale-Out File Server workloads. Using this feature, the downtime penalties against Service Level Agreements (SLA) can be avoided. 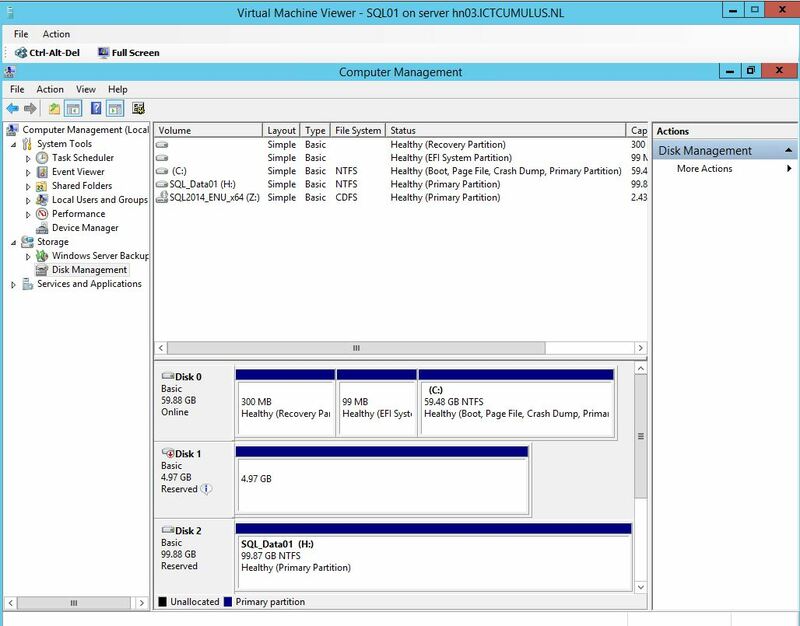 Hyper-V virtual machine and Scale-out File Server workloads can be upgraded from Windows Server 2012 R2 to Windows Server Technical Preview without downtime. 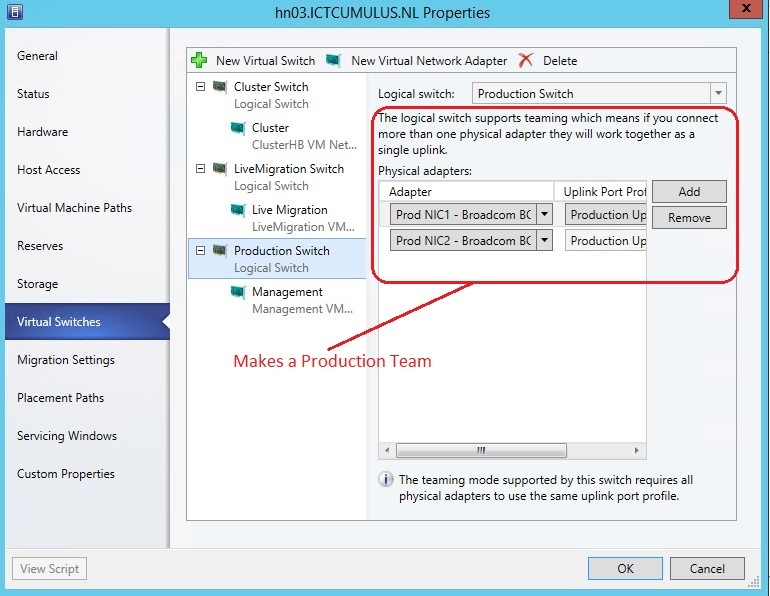 Other cluster workloads will be unavailable during the time it takes to failover to Windows Server Technical Preview. It does not require any additional hardware. The cluster does not need to be stopped or restarted. A new cluster is not required. 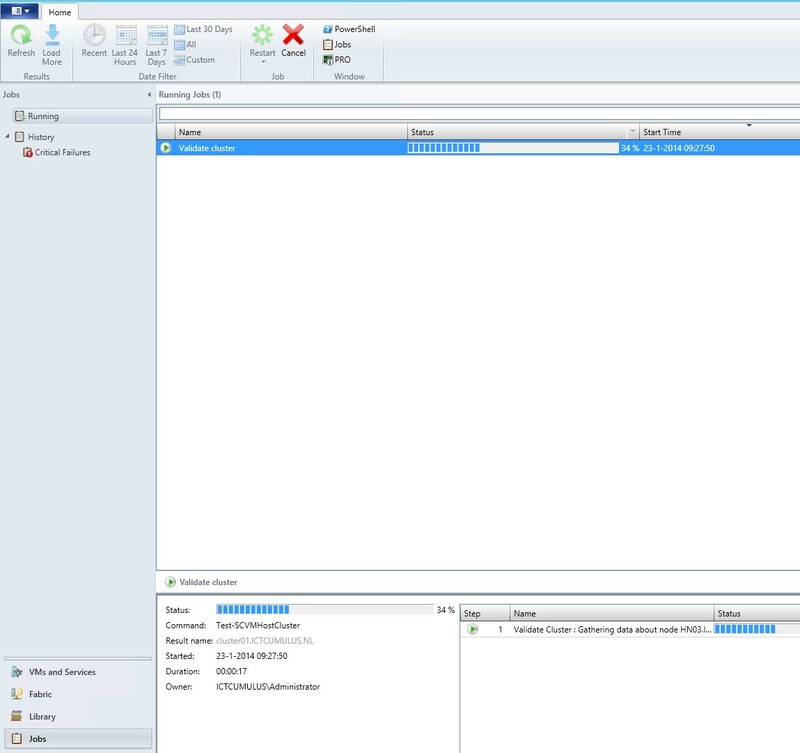 In addition, existing cluster objects stored in Active Directory are used. 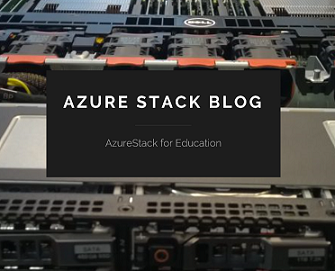 The upgrade process is reversible until the customer crosses the “point-of-no-return”, when all cluster nodes are running Windows Server Technical Preview, and when the Update-ClusterFunctionalLevel PowerShell cmdlet is run. The cluster can support patching and maintenance operations while running in the mixed-OS mode. It supports automation via PowerShell and WMI. 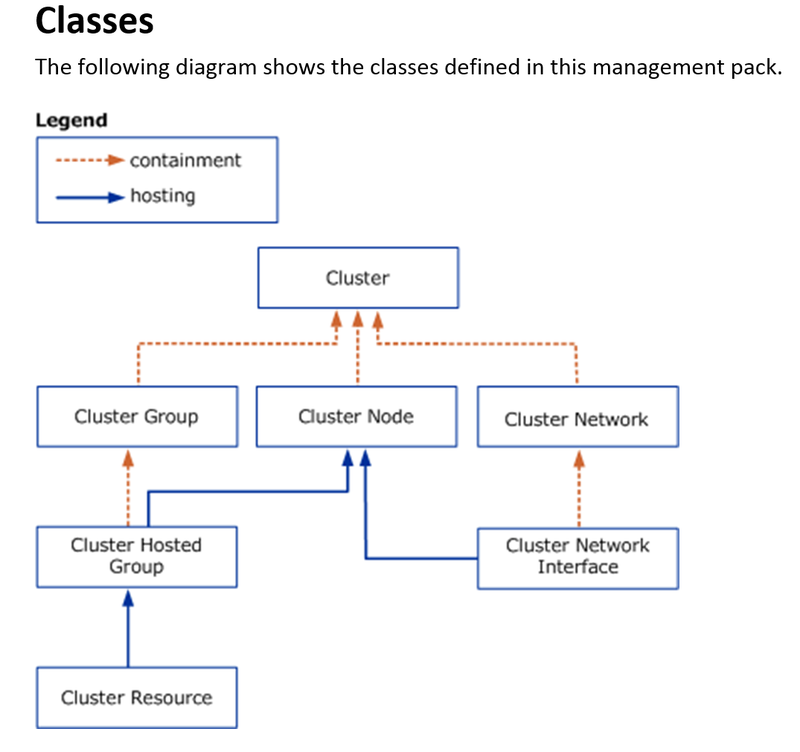 The ClusterFunctionalLevel property indicates the state of the cluster on Windows Server Technical Preview cluster nodes. This preview release should not be used in production environments. 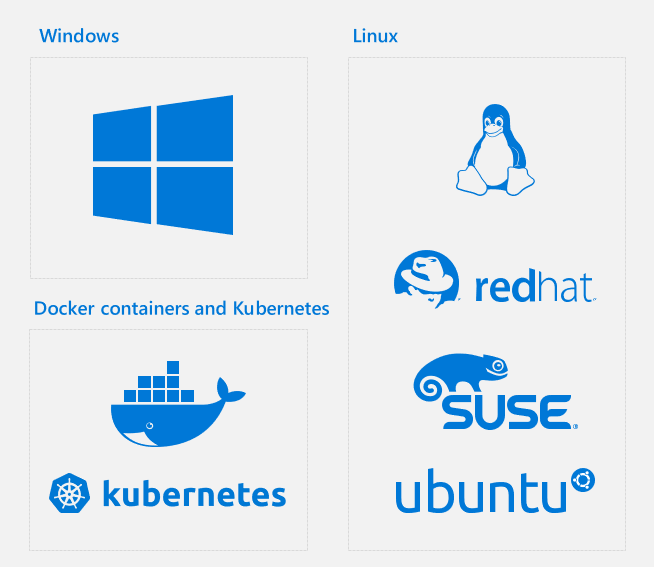 Categories: Hyper-V, Windows Server 2012 R2, Windows Server 2016 | Tags: Cluster, HyperV, WindowsServer2012R2, WindowsServer2016, winserv | Permalink. 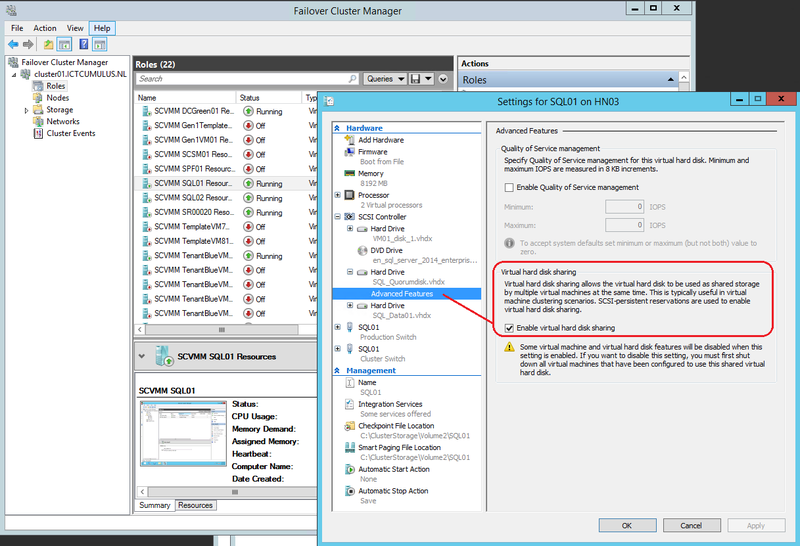 The Windows Server Failover Cluster Management Pack provides both proactive and reactive monitoring of your Windows Server 2003, Windows Server 2008, Windows Server 2008 R2, Windows Server 2012, and Windows Server 2012 R2 failover cluster deployments. It monitors Cluster services components—such as nodes, networks, resources, and resource groups—to report issues that can cause downtime or poor performance. The monitoring provided by this management pack includes availability and configuration monitoring. 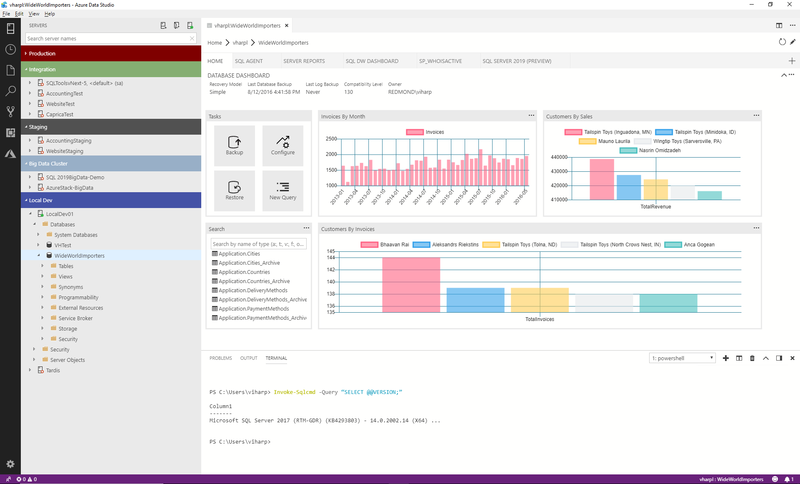 In addition to health monitoring capabilities, this management pack includes dashboard views, extensive knowledge with embedded inline tasks, and views that enable near real-time diagnosis and resolution of detected issues. 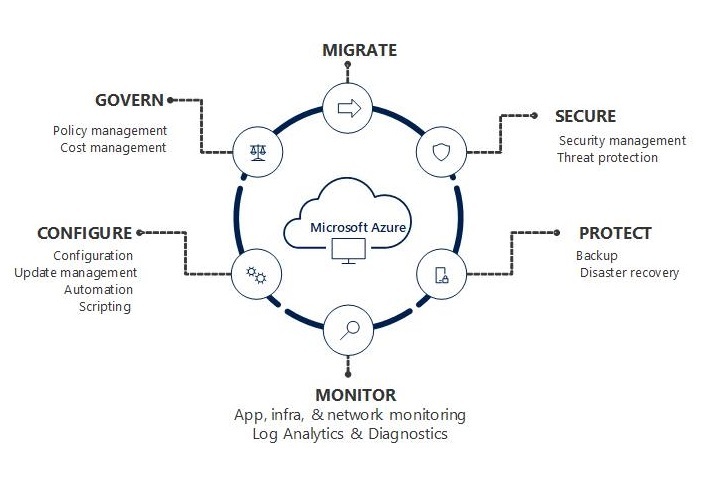 With this management pack, Information Technology (IT) administrators can automate one-to-many management of users and computers, simplifying administrative tasks and reducing IT costs. Administrators can efficiently implement security settings, enforce IT policies, and distribute software consistently across a given site, domain, or range of organizational units. Categories: System Center 2012 R2, Windows Server 2012, Windows Server 2012 R2 | Tags: Cluster, SCOM, sysctr, winserv | Permalink. This white paper demonstrates the capabilities and performance for Violin Windows Flash Array (WFA), a next generation All-Flash Array storage platform. 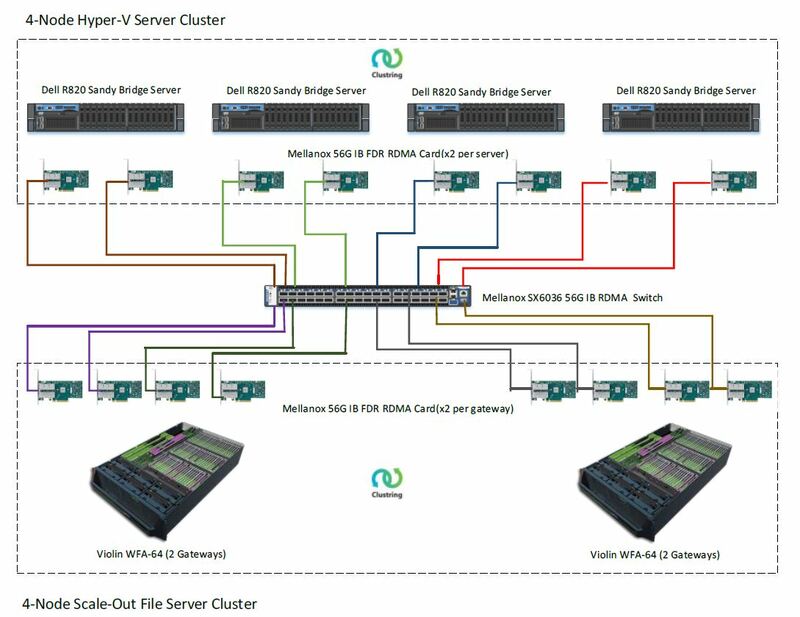 With the joint efforts of Microsoft and Violin Memory, WFA provides built-in high performance, availability and scalability by the tight integration of Violin’s All Flash Array and Microsoft Windows Server 2012 R2 Scale-Out File Server Cluster. 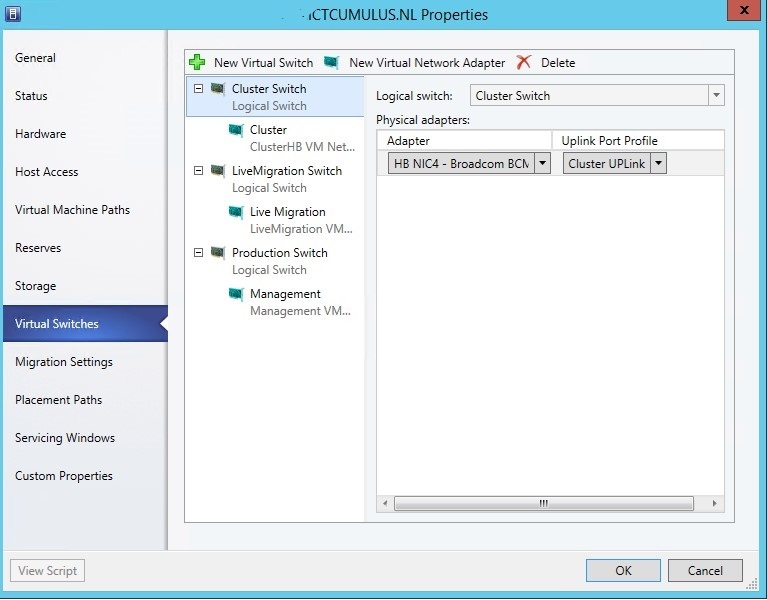 Categories: Hyper-V, Windows Server 2012 R2 | Tags: Cluster, HyperV, SCVMM, winserv | Permalink. 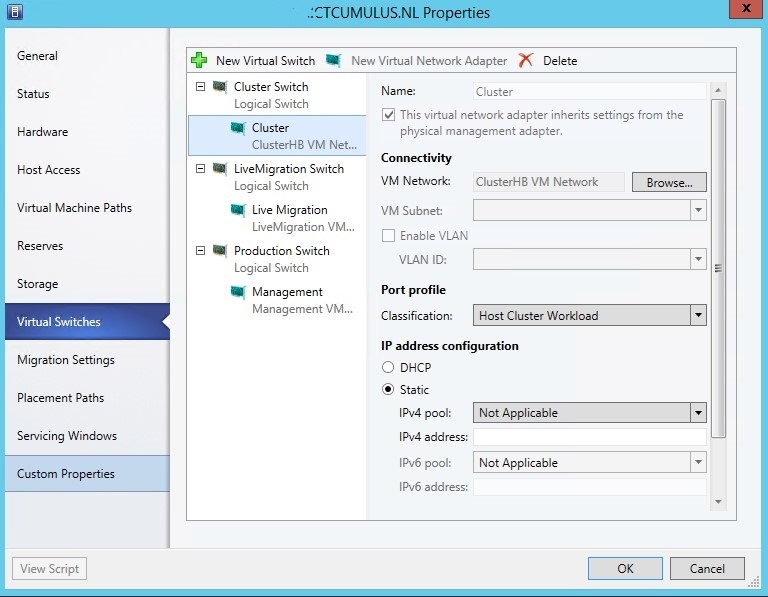 Microsoft Hyper-V 2012 R2 Cluster is running with Cluster Shared Volumes. Networking Two NICS : One on the Production Switch and NIC two on the Heart Beat Switch. This step shows how to create and then share a virtual hard disk that is in the .vhdx file format. Repeat this step for each shared .vhdx file that you want to add. For example, you may want to add one or more shared disks that will act as data disks, and a separate shared disk that you can designate as the disk witness for the guest failover cluster. 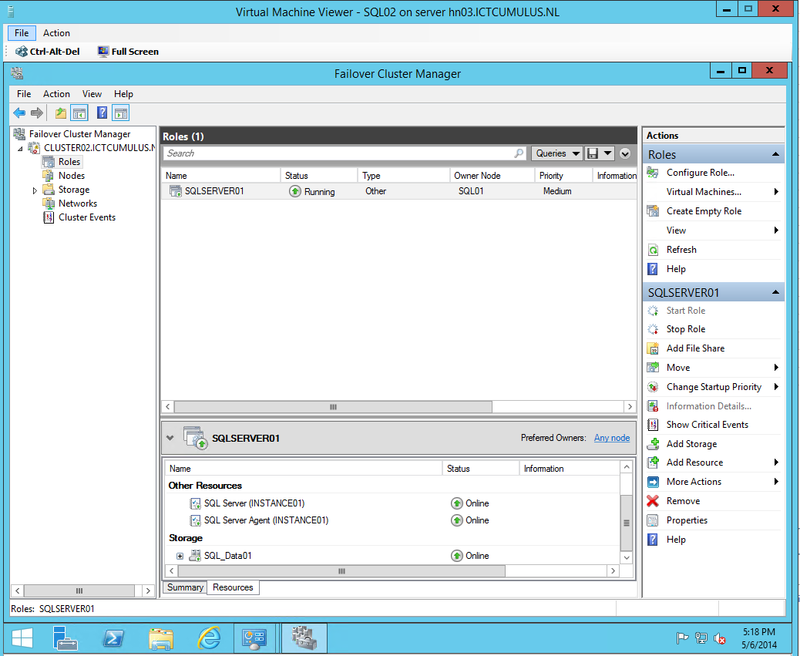 In Failover Cluster Manager, expand the cluster name, and then click Roles. In the Roles pane, right-click the virtual machine on which you want to add a shared virtual hard disk, and then click Settings. In the virtual machine settings, under Hardware, click SCSI Controller. In the details pane, click Hard Drive, and then click Add. In the Hard Drive details pane, under Virtual hard disk, click New.The New Virtual Hard Disk Wizard opens. 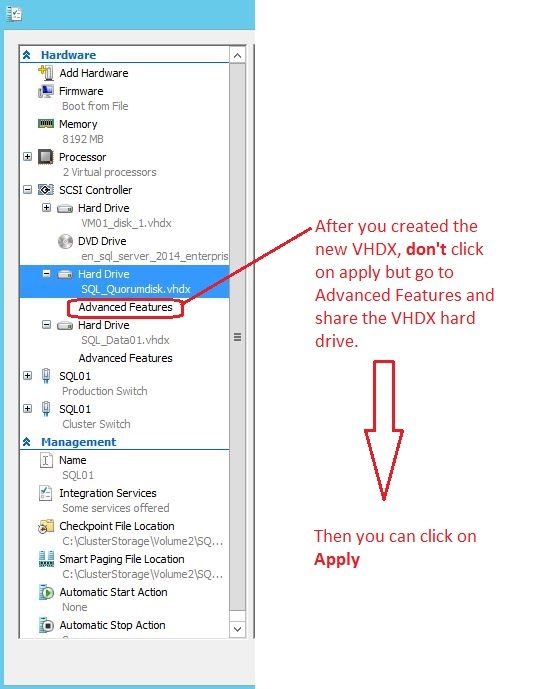 On the Choose Disk Format page, accept the default format of VHDX, and then click Next. To share the virtual hard disk, the format must be .vhdx. On the Choose Disk Type page, select Fixed size or Dynamically expanding, and then click Next. A differencing disk is not supported for a shared virtual hard disk. In the Name box, enter the name of the shared virtual hard disk. In the Location box, enter the path of the shared storage location.For Scenario 1, where the shared storage is a CSV disk, enter the path:C:\ClusterStorage\VolumeX, where C:\ represents the system drive, and X represents the desired CSV volume number. \\ServerName\ShareName, where ServerName represents the client access point for the Scale-Out File Server, and ShareName represents the name of the SMB file share. On the Configure Disk page, accept the default option of Create a new blank virtual hard disk, specify the desired size, and then click Next. On the Completing the New Virtual Hard Disk Wizard page, review the configuration, and then click Finish. If the virtual machine is running, do not click Apply in the virtual machine settings before you continue to the next procedure. If you do click Apply on a running virtual machine, you will need to stop the virtual machine or remove and then add the virtual hard disk without clicking Apply. In the virtual machine settings, under SCSI Controller, expand the hard drive that you created in the previous procedure. In the details pane, select the Enable virtual hard disk sharing check box. Remove and then add the virtual hard disk to the running virtual machine. When you do, ensure that you do not click Apply when the New Virtual Hard Disk Wizard completes. Instead, immediately configure sharing in Advanced Features. Stop the virtual machine, and then select the Enable virtual hard disk sharing check box. Add the virtual hard disk to each virtual machine that will use the shared .vhdx file. When you do, repeat this procedure to enable virtual hard disk sharing for each virtual machine that will use the disk. For the Second Guest clusternode you will add the same VHDX files you created on the first Guest clusternode and share them also like on the first clusternode. 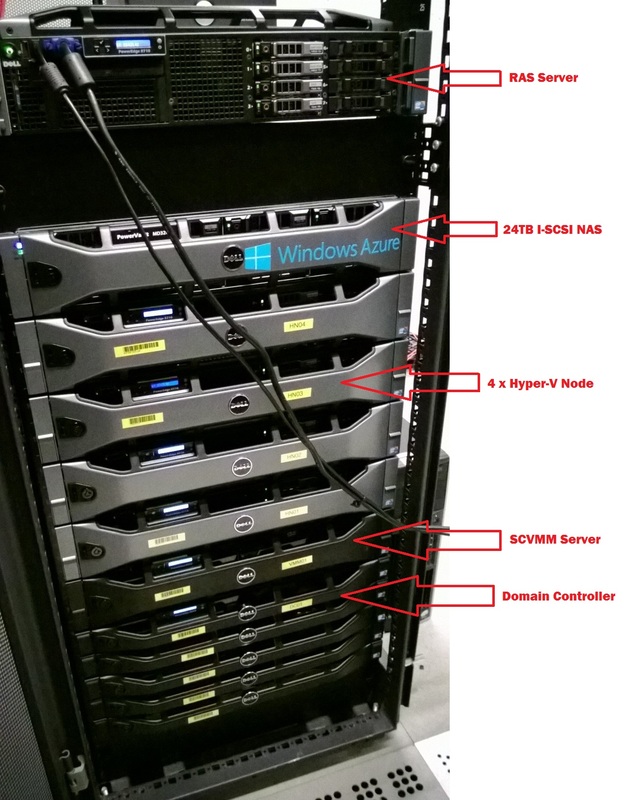 Install Failover Cluster on both nodes. 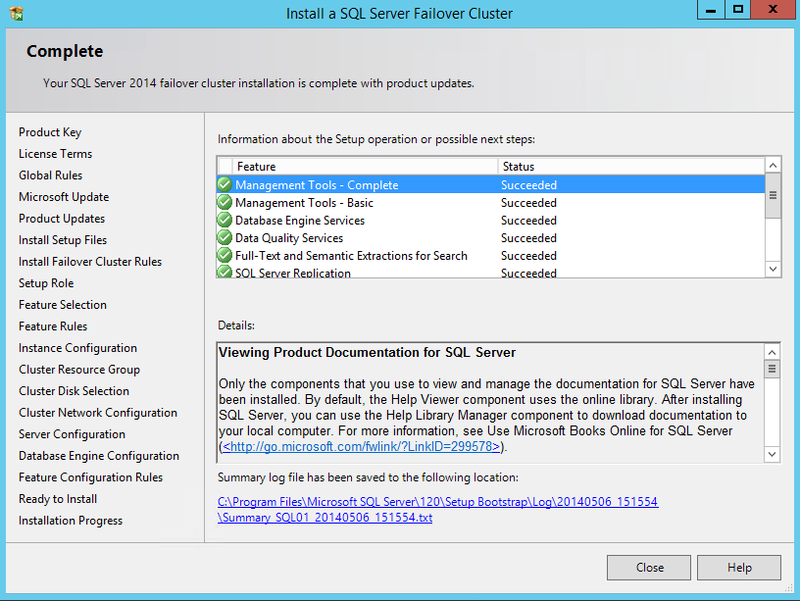 Install a Microsoft SQL 2014 Guest Cluster. 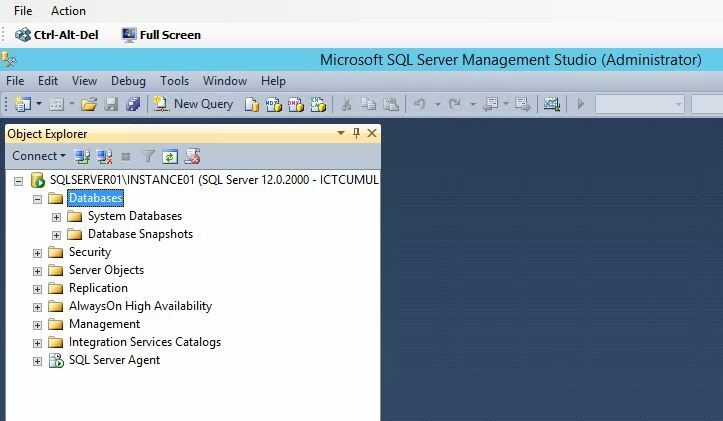 Install Microsoft SQL 2014 Server for Clustering. 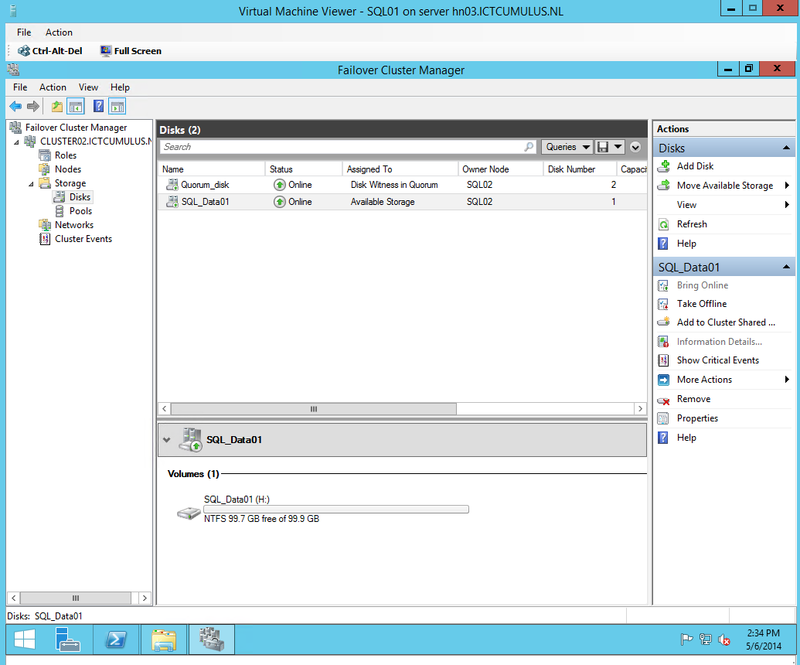 Guest SQL 2014 Cluster is running on Hyper-V 2012 R2. 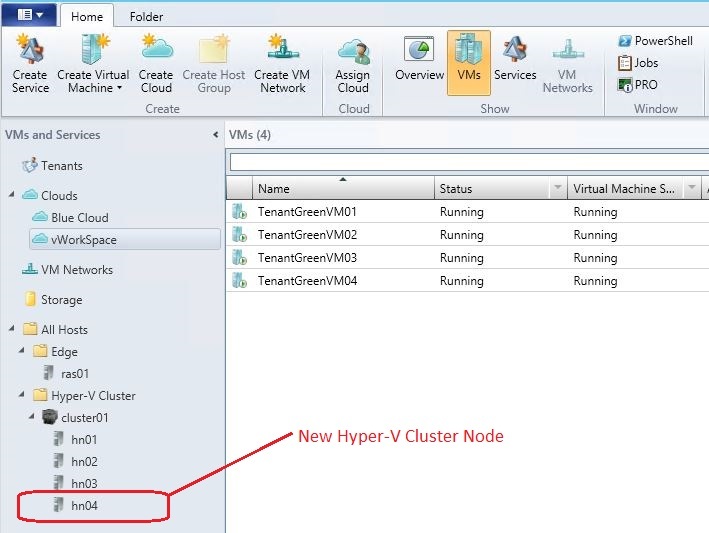 Categories: Hyper-V, SQL, Windows Server 2012 R2 | Tags: Cluster, HyperV, SQL, SQL2014, VHDX | Permalink. Microsoft Operating System is Windows Server 2012 R2 in a Single forest. Go to all Hosts and add the new Hyper-V node into SCVMM with this wizard. the properties of the new host. Here you set the right NICs to the Logical networks. Just set the right NIC and UP-Link port profile to the Virtual Switch. 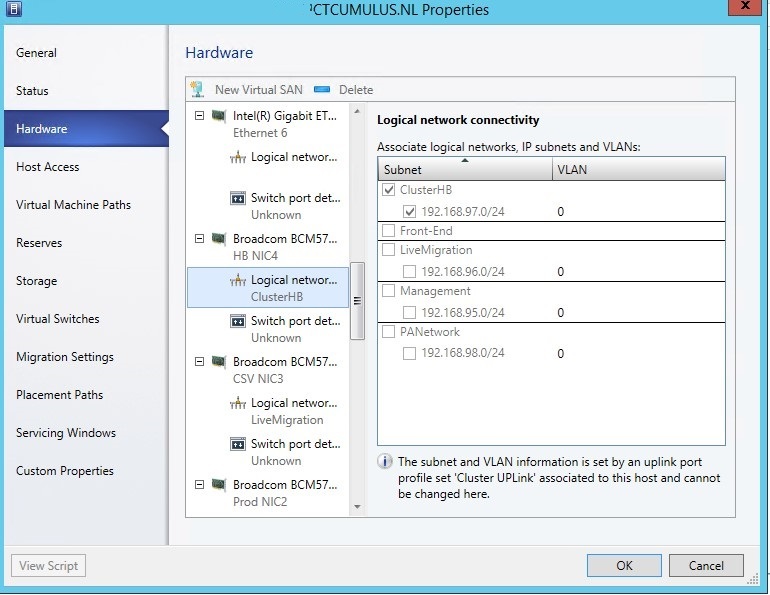 Here you set the VM Network and static IP address. 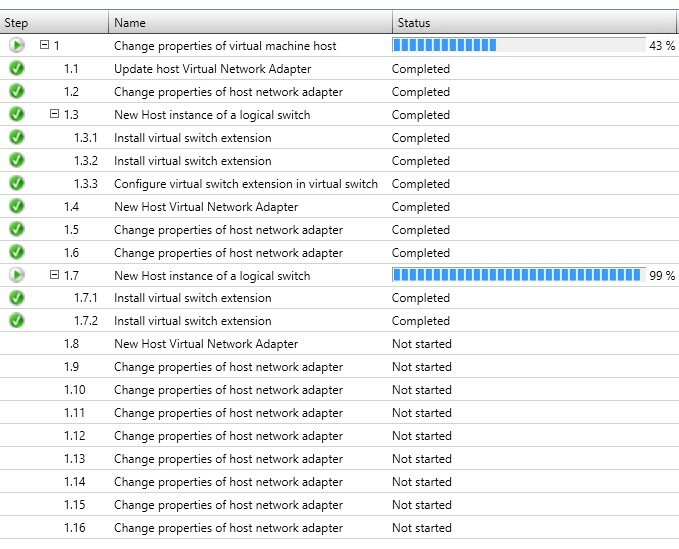 When all of the properties are set, click on OK and the settings will be provisioned to the new Hyper-V node. 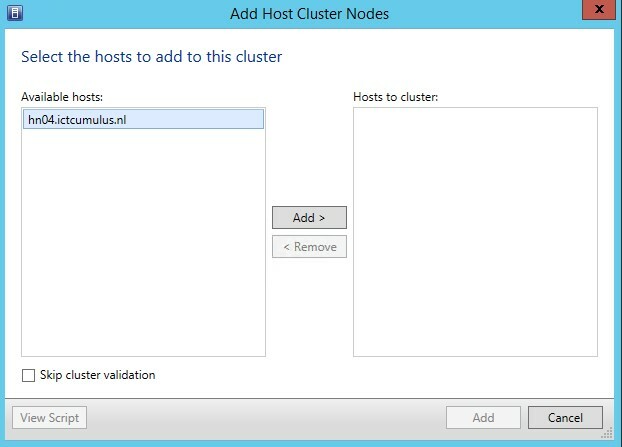 Validate Hyper-V Cluster to see if there are any issues in the Cluster. 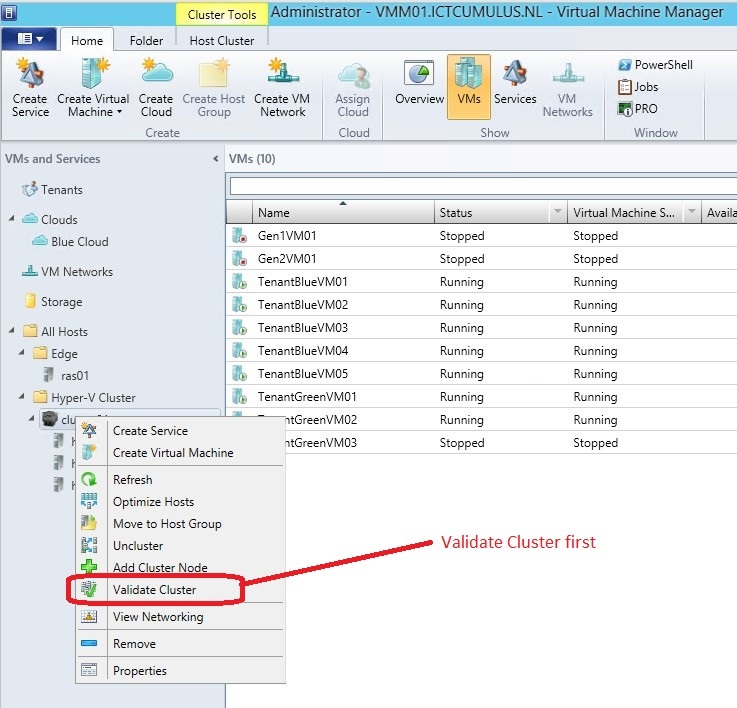 Hyper-V Cluster is validating for any issues. 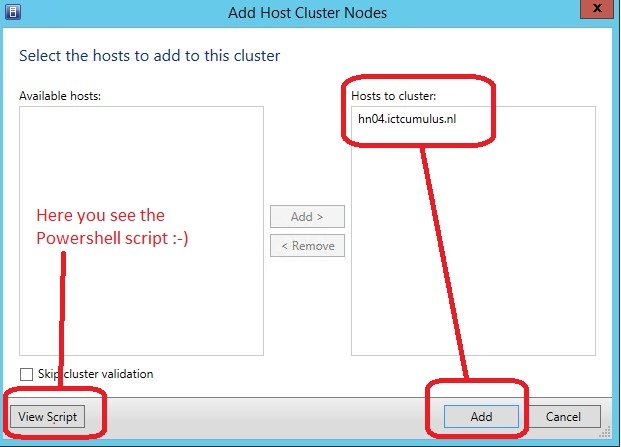 Right click on the Clustername and Click on add Cluster Node. Here you see the host to add. 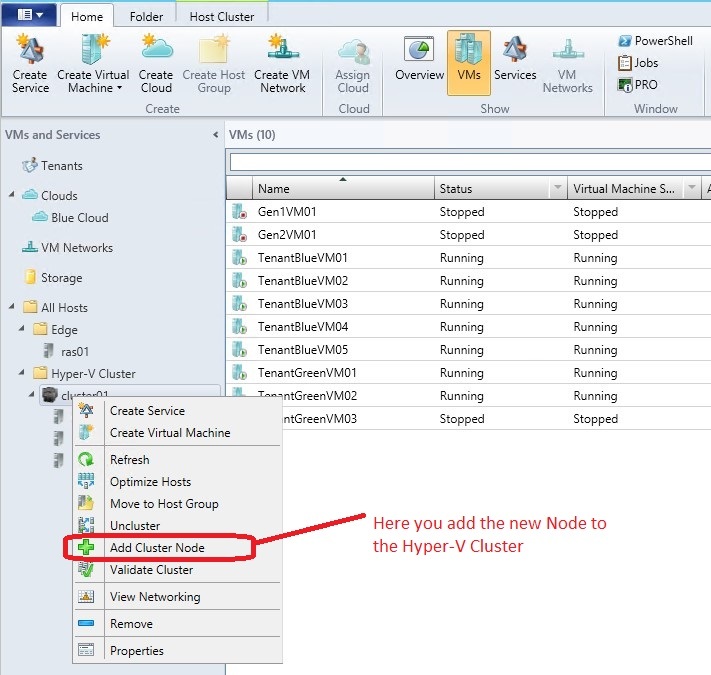 Click on Add and the Hyper-V Node will be add to the Hyper-V Cluster. 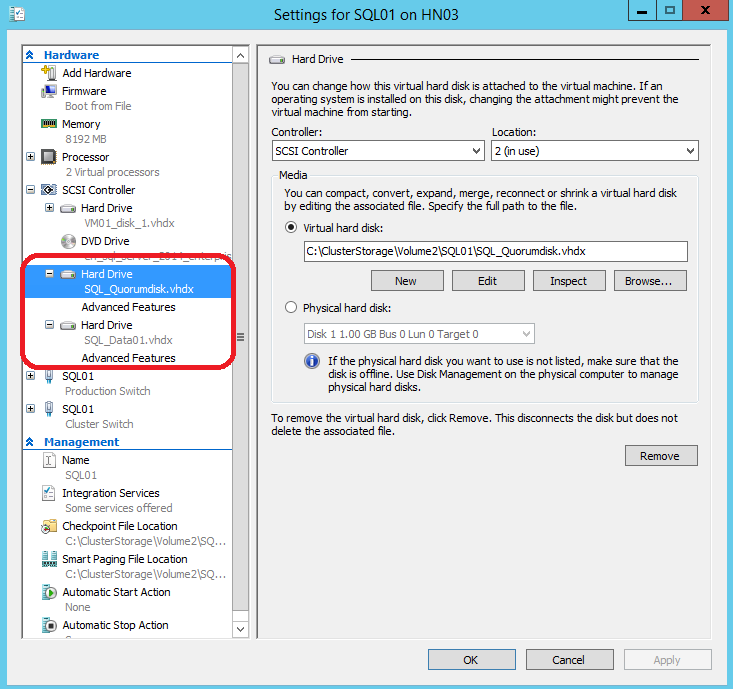 Categories: Hyper-V, System Center 2012 R2, Windows Server 2012 R2 | Tags: Cluster, HyperV, SCVMM, sysctr, WS2012R2 | Permalink.